Gabriele, the restaurant’s charismatic owner, greeted me as he would an old friend and quickly eased me into the wine menu while taking me through the intricacies of a night at Cavallini. With the option of ordering off the alla carta menu or off the set menu, there is undoubtedly something that caters to each and every taste. After much deliberation I opted for the ‘Mare’ (fish) menu. The subtle antipasto of thinly sliced raw salmon with a celery gelee and a touch of creme fraiche paved the way for my favourite dish of the meal: seafood gigantoni. In each bite was a new burst of flavour, the pasta rings concealing an assortment of mussels, white fish, and homemade confits. Next came a delicate fillet of seabass before the meal drew to a close with a wonderful concoction of wine-soaked pears, vanilla mousse and chocolate crumble. My fellow diner opted for the ‘Terra’ (meat) option, and his dishes were equally as rewarding as mine had been. A tender beef tataki was complimented by a whisky based salsa, before he was served piglet dumplings perched on a spring onion base. His main course exhibited some of Italy’s finest ingredients as a sirloin steak was accompanied by grilled chard, amaranth, and a creamy burrata. The meal was rounded off with a sumptuous deconstructed raspberry cheesecake. We also could not resist trying Cavallini’s own take on the traditional tiramisu, the ‘Tiramisu sepolto.’ Being a tiramisu-lover myself, I had high expectations but was most definitely not disappointed. It is in my a opinion a must-try dish, made with not one but two different types of velvety mascarpone and covered with a crunchy chocolate biscuit crumble. Aside from the taste, the striking presentation of Cavallini’s dishes makes them all the more inviting and shows the chef’s utmost attention to detail. Whether splattered with vibrant streaks of green pea puree or black cuttlefish sauce, a Cavallini culinary experience involves all the senses. Throughout the meal, plate that appeared seemed more impressive than the last, so much so that I found myself not wanting to destroy the work of art placed in front of me by eating it. This is not to say however, that the food at Cavallini prioritises style over substance as can sometimes be the case in so-called fine dining restaurants. Instead, Cavallini exudes its passion for enogastronomy by uncompromisingly providing food, wines and spirits of the highest quality. I left Cavallini feeling pleased that a cuisine I know so well still had so much room to impress and surprise me. 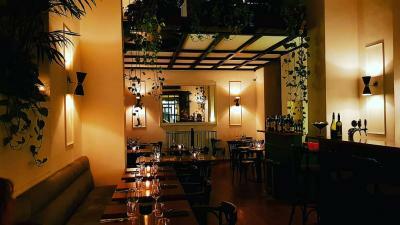 Cavallini, located on Via Pietro Cavallini 23, Rome (00193),is open Monday to Saturday for lunch from 12:00 to 15:00, and for dinner on Wednesday to Saturday from 19:00 - 00:00. The set menus cost 35 euros for four courses, excluding drinks, while a la carte options range from antipasti for 10 euros to secondi at 18 euros.